Prone to typhoons, floods, and earthquakes, Japan has developed unique skills in coping with natural disasters. With deep expertise in everything from physical infrastructure to rapid recovery, the country has made disaster-proofing into an exact science. "It was an ‘All Japan’ team effort. Everyone involved was highly motivated"
On September 5, 2018, the day after Typhoon Jebi barreled into Osaka Bay, Yutaka Okuda went to work by boat. He had no choice. Road and rail access to Kansai International Airport (KIX), the offshore airport where he is technical department manager, was cut off after a tanker crashed into the bridge linking it to the mainland. 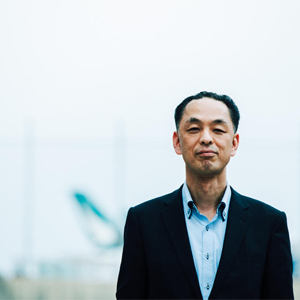 Okuda and his team camped out in their offices, determined to get the airport running again as fast as possible. 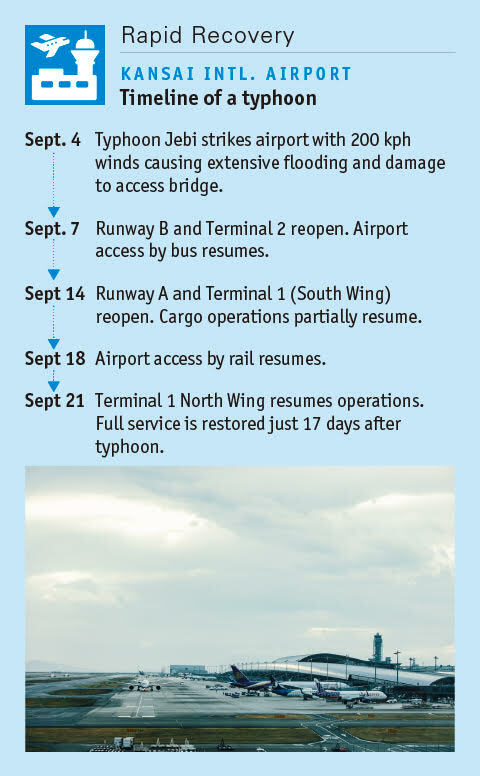 After achieving partial reopening on September 7, they restored full service by September 21, just 17 days after the typhoon hit. Once again, tens of thousands of domestic and international passengers are now using the airport on a daily basis. 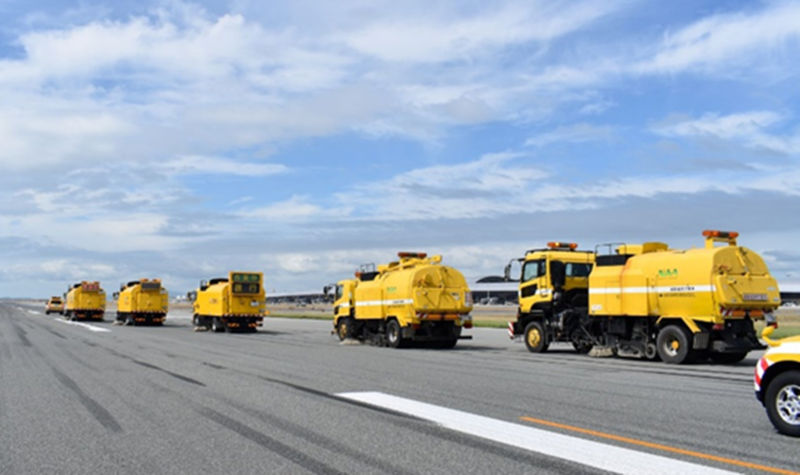 With the airport up and running at full capacity again, Okuda is now focused on devising strategies to reinforce its long-term resilience against future extreme weather events. Solutions under consideration include raising the height of the seawall, isolating key electrical equipment behind submarine doors and barriers, and acquiring more pumps. Now that global warming is causing ever more extreme weather events, artificial islands are not the only places at increased flood risk. In the traditionally temperate UK, for instance, the government listed flooding as a major threat for the first time in the 2017 edition of National Risk Register for Civil Emergencies. And with good reason. According to the UK’s Met Office, nine of the 17 record-breaking rainfall months or seasons since 1910 have occurred since 2000, with the winter of 2013–2014 the wettest winter for 250 years, and December 2015 the wettest month ever recorded. In both cases, thousands of homes were flooded. The risk of floods is exacerbated by urban sprawl. Think of Hurricane Harvey, which unleashed eight days of rain on Houston, Texas in August 2017 and damaged more than 300,000 structures at a cost of $125 billion. According to a report in Nature, the city’s risk of extreme flooding was 21 times greater due to urbanisation. Not only had man-made structures created “surface roughness” that “snagged” the hurricane and held it in place, but the increase of impervious pavements and roads prevented heavy rainfall from being absorbed into the ground. Tokyo has taken active steps to reduce flood risk. As the city’s population grew in the twentieth century, the Naka and Ayase River Basins to the south of Tokyo saw rapid suburban expansion accompanied by a dramatic change in the land utilisation profile. Between 1955 and 2010, built-up areas’ share of total land use there rose from 5% to 52%, while rice paddies and fields’ share declined from 68% to just 33%. The local topography did not help matters: not only is the area bowl-shaped—meaning that excess rainwater tends to stay put—but it contains five rivers with unusually low gradients—meaning that water is slow to drain into the sea. With serious floods becoming routine in the 1980s and 1990s, Japan’s Ministry of Land, Infrastructure, Transport and Tourism (MLIT) decided that radical measures were needed to protect the 3.3 million people living in the suburban area. It took things to the next level—literally. "This facility is the epitome of Japan’s cutting-edge civil engineering technology"
The MLIT had already built several above-ground river discharge ducts to channel the area’s flood waters when it started constructing an underground flood control channel in 1993. 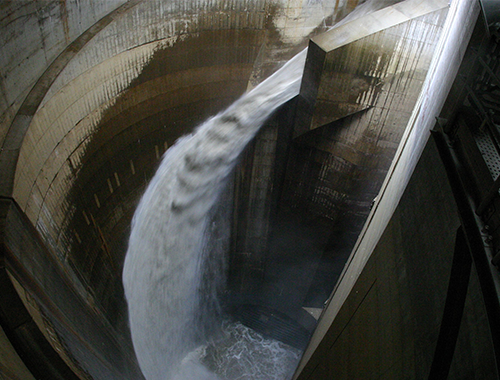 Consisting of five shafts that collect runoff from five rivers, direct it along a subterranean tunnel, then pump it up into another river and thence to the sea, the Tokyo Flood Control Channel—or Metropolitan Outer Area Underground Discharge Channel (MOUDC) as it is officially known—cost nearly $3 billion and took 13 years, from 1993 to 2006, to build. 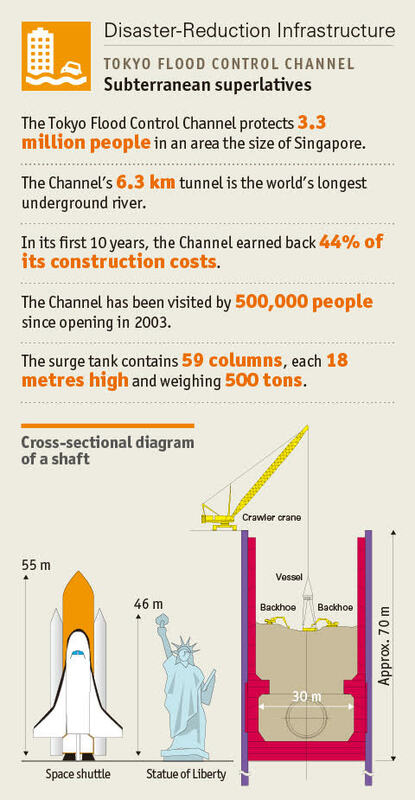 Among the half million tourists who have now visited the Tokyo Flood Control Channel are overseas government officials, embassy staff and civil engineers, the majority of whom come from flood-prone Southeast Asia and the lower-lying northern European countries like Germany and the Netherland. All are eager to take home with them the lesson of how investing in physical infrastructure can significantly reduce disaster risk. "We want to make weather guidance more quantitative and reliable"
Of course, constructing elaborate physical infrastructure can never be a universal solution to the problem of flooding. Floods will inevitably occur somewhere as a residual disaster risk. In that case, the goal should be to minimise the danger by providing early warnings that enable people in the affected areas to take the necessary precautions. This requires the ability to forecast accurately where storms and typhoons will strike and how much rain they will produce. Here again Japan stands in the vanguard. Anyone who has visited the country will have been struck by the unusually detailed weather forecasts on television, which predict rainfall not in the normal and somewhat vague terms of intensity (heavy, light, etc. ), but in terms of numbers of millimetres. This precise quantitative precipitation estimation (QPE) is the result of applying an algorithm to combined observation data from multiple equipment sources, ranging from weather radar and weather satellites—both particularly important for short-range forecasting of violent weather phenomena—to automatic weather stations. With a rainy season in June and a typhoon season in September, Japan needs precise levels of forecasting to ensure it is ready for disaster. Two elements go into achieving this level of precision: First, there is hardware in the form of high-quality weather observation equipment, then there are soft skills in the form of the meteorological know-how to extract and interpret data with extreme accuracy. Japan actively shares the meteorological know-how it has developed with other countries worldwide. 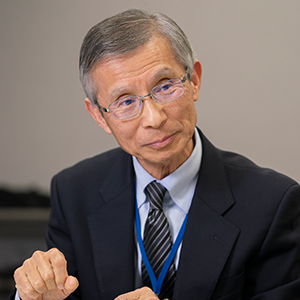 "The quality of weather forecasts in Vietnam is being improved in cooperation with Japan"
"Our contribution to disaster risk reduction around the world is based on Japan&apos;s experience." Vietnam is a case in point. 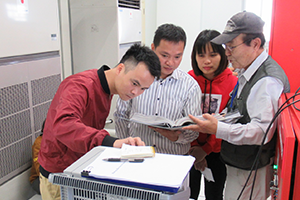 The Vietnam Meteorological and Hydrological Administration (VMHA) recently took delivery of two Japanese weather radar systems under grant aid. These radars play an indispensable role in providing short-range forecasts of weather phenomena like tornados and typhoons that can cause strong winds and flash floods. “The quality of weather forecasts in Vietnam is being improved as a result. The assessments of the World Meteorological Organisation (WMO) clearly demonstrate this,” states Nguyen Vinh Thu, project manager at the VMHA. The improved data of the beneficiary countries also helps improve the WMO Integrated Global Observing System, which pulls together observation data from all around the world into a single, coherent framework used by countries everywhere to make forecasts. In other words, when Japan helps other countries improve their meteorological data, a virtuous circle is set in motion that benefits Japan and all other countries. 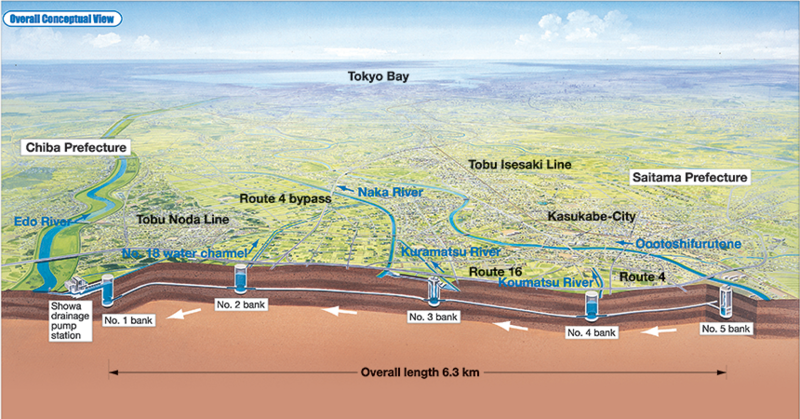 Resilience has many constituent parts as illustrated by the experience of Kansai International Airport and the positive impacts of the Tokyo Flood Control Channel and Japan’s meteorological expertise. In having all the pillars of resilience in place, Japan is a living case study in disaster-preparedness.